This incomparable book explains in clear English the different dispute resolution procedures of which companies and their counsel can take advantage in the course of doing business. The author pays close attention to the underlying treaties and protocols, some of which are not available in English. Especially valuable coverage includes information that has been dispersed and difficult to locate in English, such as details of MIGA’s dispute mediation service and recent changes in Central American Common Market rules. Acknowledgments. Foreword. Preface. Chapter 1. 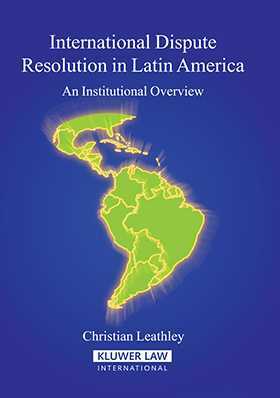 Latin American Integration Association (ALADI). Chapter 2. Investment Protection – Bilateral Investment Treaties (BITS) and Free Trade Agreements (FTAs). Chapter 3. Organization of American States (OAS) – Inter-American Commission on Human Rights (IACHR) and Inter-American Court of Human Rights. Chapter 4. Inter-American Commercial Arbitration Commission (IACAC). Chapter 5. Andean Community (CAN). Chapter 6. Caribbean Community (CARICOM) – Caribbean Court of Justice (CCJ). Chapter 7. Mercosur. Chapter 8. Mercosur – Mercosur International Commercial Arbitration Agreement (MAA). Chapter 9. Central American Common Market (CACM) or Central American Integration System (SICA). Chapter 10. Group of Three (G-3). Chapter 11. Dominican Republic-Central American-United States Free Trade Agreement (US-CAFTA-DR). Chapter 12.Free Trade Area of the Americas (FTAA). Chapter 13.Multilateral Investment Guarantee Corporation (MIGA). Chapter 14. Overseas Private Investment Corporation (OPIC). Chapter 15. Inter-American Development Bank (IDB) – Inter-American Investment Corporation (IIC) and Multilateral Investment Fund (MIF). Glossary. Annex I. ICSID Convention. Annex II. ICSID Arbitration Rules. Annex III. UNCITRAL Arbitration Rules. Annex IV New York Convention. Annex V. Panama Convention. Annex VI. Vienna Convention. Index.